Why is everything in miniature form so cute? I love mini everything, especially desserts. My mini chocolate chip cookies are one of my favorite cookies. Everyone loves them because they are tasty, but I think they are so popular because they are so stinkin’ cute! 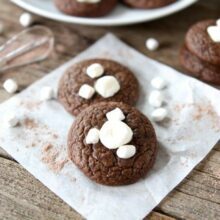 My newest favorite mini dessert are these Mini S’mores Cookies. They are too cute for words and boy are they delicious! The cookies taste exactly like S’mores. They are almost too adorable to eat, but I caved in and ate one. Ok, maybe I ate two, or three, or four:) They are small so you can have as many as you want, right? 🙂 The cookies taste great right out of the oven, but I think they taste even better the second day. The cookies stay soft and chewy and all of the flavors sink in by the second day. S’mores heaven! 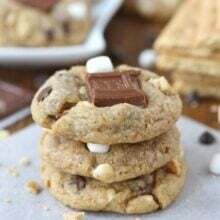 These Mini S'mores Cookies are made with graham cracker crumbs, mini chocolate chips, Mallow Bits, and Hershey's Milk Chocolate Candy Bars. They are almost too cute to eat! Preheat the oven to 350 degrees F. Line a large baking sheet with a Silpat baking mat or parchment paper and set aside. In a large bowl, whisk together graham cracker crumbs, flour, baking soda, and salt. Set aside. In the bowl of a stand mixer, beat the butter and sugars together until creamy and smooth, about 3 minutes. Add in the egg and vanilla extract and mix until combined. Slowly add the dry ingredients and mix until just combined. 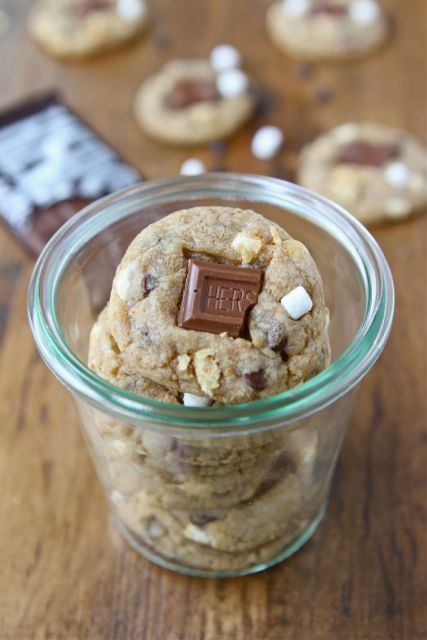 Stir in the Mallow Bits and mini chocolate chips. Roll a teaspoon of cookie dough into a ball. Press half of a Hershey's chocolate square on top of the cookie and gently press down. I stuck in a few extra pieces of graham crackers and Mallow Bits onto the top of the dough for looks, but you can skip this step if you wish. Continue making all of the cookies. Place the cookies on the prepared baking sheet, about 1-inch apart. Bake for 6-8 minutes, or until cookies are set. Cool on the baking sheet for 2 minutes and transfer to a wire cooling rack. I’m a sucker for anything mini! These are so cute! And I am sure they are delicious too. Love the touch of a piece of Hershey’s chocolate on top! bahhh! I have to work then- I would have loved to take part! These cookies look amazing. Smore in mini form? Plus cookie dough? Can’t go wrong. These little cookies sound fabulous! Yum! These cookies look wonderful! I think it’s a great idea to use the graham cracker crumbs in the cookie dough. I can’t imagine the taste and texture, so I guess I better get to making these! Thanks for the recipe. Mom It Forward is a social media community for women and moms. It’s a neat site. Check it out and hopefully you can join us for our chat! and talking cookies?……I’m SO there!! OMG! You make the best treats! These cookies sound wonderful!!!! I want to eat them all!!! Mini is always better! So cute! 😀 These are just precious. I’m delighted to see that you put graham cracker crumbs in the cookies; this is so clever to me and I’ve never seen it before! 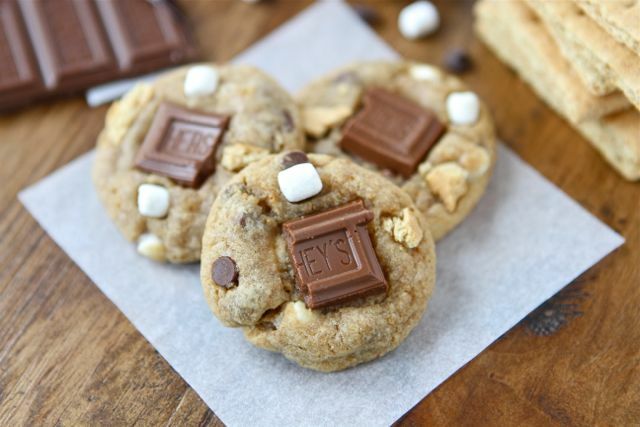 The grahamy flavor is one of my favorite parts about s’mores, and the gooey chocolate with teeny marshmallows makes for a delicious and adorable cookie! Your mini cookies are too cute! I made a full-size version of these and couldn’t keep my hands off of them. You really are the cookie queen! These are adorable! I hope y’all had a fabulous first Easter with Caleb! These cookies look amazing. They’re so cute! Do the bits melt inside the cookie, or do they stay intact? I always find that regular marshmallows dissolve in baking. Maria, these are so fun! Cute styling too!!! How cute are those? I love the Jet-Puffed marshmallows. SO much fun! So fun. I’ve been wanting to find the little marshmallow bits. Now we don’t have to have bonfire to get these delicious treats! Oh my cookieness! I love s’mores, and I love cookies. What perfection! those cookies are A.DOR.A.BLE. 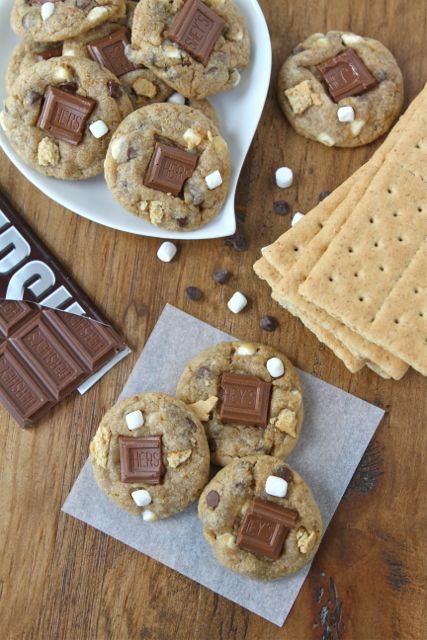 🙂 & i am a s’mores fanatic… so I can’t wait to try em! Hope you had a wonderful Easter! HOw cute are these cookies? I can already tell that these are going to be dangerous. How can I pass up a mini cookie with all my favorite things? TOO cute, Maria! I came across these marshmallow bits a while back and passed them up but I knew that it would only be a matter of time before they started showing up in treats on my favorite blogs. These are awesome! Gorgeous! And pretty much awesomeness!!! Those cookies are adorable. I saw them all over Pinterest this morning and could not wait to jump over here and read your post. So cute! These are super cute! 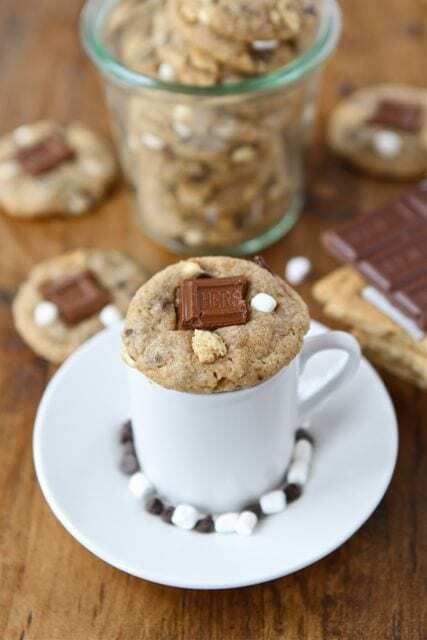 Who doesn’t live mini desserts, these are a great use of those mini marshmallows. I have been doing everything I can to not buy a container! These make me so excited for summer. I haven’t tried the new mallow bits but can’t wait to try them. oh my gosh how cute are these! my kids looooooove s’mores (so do I 🙂 ). What a fun treat! such a fun use for the mallow bits! and yes, everything is cuter in mini form! I will be making this tonight… probably my favorite thing ever! Ahhhh these are adorable!!! I totally just squealed haha 🙂 But you’re right – tiny things are too cute & irresistible! Love these!!!! Yum. I’ll be making these soon. Thanks for the recipe! i love the little broken pieces of hershey bars on top! The mini marshmallows are so cute! They would work much better than the marshmallows I have on top of mine. I will have to look for them. These are so cute!! Tiny is always cuter.. and then you can convince yourself they are better for you because they are small… even though you probably really just eat more. I’ve been trying DESPERATELY to hold off on going to target to stock up on fun chocolate and M&M and marshmallow treats…but this has tipped me in the INEEDTOGONOW direction. So cute! 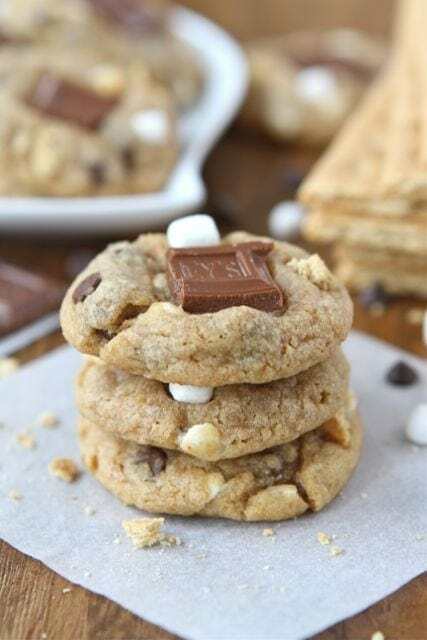 I love all things s’mores and these are absolutely adorable and SO delicious-looking. I just keep coming back and love your recipe’s… fantastic! Maria, yummy!!! These are adorable, and because they are mini I’ll take a dozen please! Can’t get over how great these look. S’mores are one of my favorite sweet and indulgent snacks/desserts! These cookies look so yummy! Especially in mini form! I have been wanting a reason to buy these Marshmallow bits and I think this just might be it! 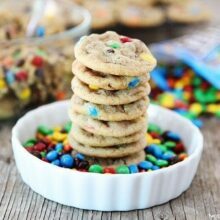 Your cookies look so perfect and are making my mouth water! If you eat smaller cookies, you can have “more” of them without guilt. Brilliant! These look just darling! Where did you find such tiny mallows??? These are so cute and delectible! So perfectly ‘poppable’! Absolute cuties! I hope you had a great Easter weekend! Beautiful little cookies! I’d love to have two or three with a cup of coffee right now. Way too cute! They look like just the perfect size. Those look so good! and adorable too! How would you recommend carrying the cookies around to get them to a party? These look absolutely gorgeous! I must try them, can’t wait….. Thank you for sharing! Thanks for posting the recipe for these adorable cookies! I bought a big bag of those marshmallow bits a while ago and have been looking for ways to use them up! I baked your cookies this weekend, and they were super delish! I ended up making way more than 3 dozen though! I linked to the photo of them. I had the same question as another poster..do the marshmallows melt inside the cookie? The marshmallows are so tiny, they don’t really melt. I made these this past Saturday with my sister in law (she’s 5). I couldn’t find the tiny marshmallows anywhere so I ended up with the normal miniture ones and just decided to make slightly bigger cookies. While they tasted great, they ended up being very messy and sticking the the pan (even after being greased!). Yummy but a bit much trouble. Haha! And then the dog jumped on the counter while they were cooling and ate like 5 of them. Dumb dog! I love anything too cute to eat, and I love S’mores. Fabulous idea! I made these this weekend for a BBQ and they were a huge hit! They are, first of all, ADORABLE and also happen to taste amazing. Four friends have already requested the recipe and one lady asked me if I was a professional baker. Not. Even. Close. Thank you so much for such a great recipe! Another fabulous recipe!! Everything I make from your site is a HIT at my work. Just wanted to give a big THANK YOU and I look forward to more wonderful cookie recipes! Thanks Lindsay! Glad you are enjoying our recipes! These look amazing and I was so excited to make them until I discovered that I can’t find the mallow bits anywhere 🙁 I’m not sure where else to look. Love your blog and your cookies! I just made these today and we really struggled with getting our cookies to form. I think part of the problem was too many choco-chips in the recipe that there wasn’t enough batter to surround them and make them “cookies”. When I first saw these cookies, I thought they were adorable and they also looked delish! I just finished making them and they are AWESOME!! My husband says their the best cookies I’ve made yet…and I make A LOT of cookies! Thank you so much for such a great recipe! I will keep these in my favorites! Just made a double batch of these for a Memorial weekend picnic. I left off the Hershey bar on top (not a fan of milk chocolate) but they are still chocolatey enough for a true chocolate lover. They have a nice graham flavor too. I love how these marshmallow bits stay intact instead of splitting and causing a melty mess like the ‘regular’ mini marshmallows can do. A perfect dessert for s’mores lovers! my cookie dough was really crumbly, is that normal? i think i over cooked them too, but they were really soft, so i left them in the oven a little longer…would love a little help!! 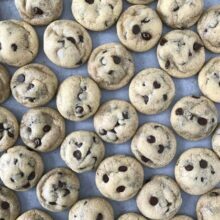 The dough should form a ball and you should be able to roll the cookies into little balls. Sorry you had trouble! Any suggestion on the crumbly dough? Less graham cracker crumbs? They still tasted good. Thanks! Yes, you can use less graham crackers if your dough was crumbly. 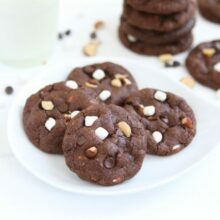 hi, how can i make the cookies to be more crisp? is there any ingredients i have to add/reduce? thanks a lot. Just stumbled on your blog and found lots of interesting recipes to try. My 20 month old daughter and I made these cookies tonight – but in full size instead of mini. They were so easy and so very delicious! We did all the mixing in the food processor after grinding the graham crackers, so only one bowl to clean. Tasted just like summer camping. Just wanted to say thanks! These are so adorable! I can’t wait to make these!!! Do you think it matters what kind of Marshmellow I use? Can you make dough ahead and freeze? Can dough be made ahead of time and freeze? Can I use white whole wheat flour and coconut oil instead of butter and flour? I love you guys!! I just made one of your recipe!! Yummy! I only used 3/4 cup graham cracker crumbs, as I was worried these would be too crumbly with the full cup. Glad I did, as the dough was still a bit crumbly anyway. I didn’t make these mini — just used a cookie scoop and baked them for 11 minutes at 350.